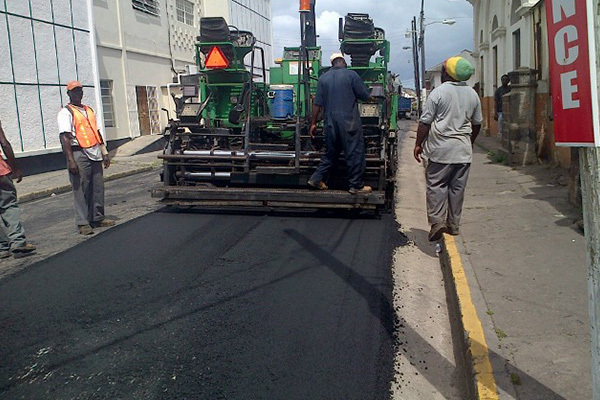 Basseterre, St. Kitts (CUOPM) – Resurfacing of Central Street has begun. Cuban-trained Road Engineer in the Public Works Department, Ms. Lareine Gumbs said milling and grading is taking place between the sections between Five Ways and Browne’s Bakery and West Bourne Ghut and College Street. “No work will be done on Friday as it is a busy shopping day. We will recommence work on Saturday with the re-surfacing of both areas,” she told the Communications Unit in the Office of the Prime Minister (CUOPM) on Thursday. The re-surfacing of Central Street is among several major road projects being undertaken on St. Kitts. The projects include construction of a tunnel at Timothy Hill on the Dr. Kennedy Simmonds Highway and the entire South East Peninsula from the Cockleshell Bay Road to Frigate Bay, going all the way past Sugars to the road linking the Kim Collins Highway, Pond Road, Sanddown Road and the Newtown Bay Road towards the Pelican Mall.